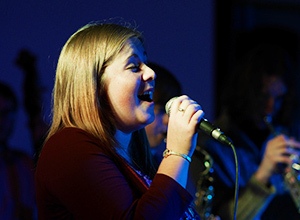 The BMus Jazz Performance degree offers you a high level of performance development, combining a focus on developing your solo performance skills in singing and/or playing, and a complementary set of skills as an ensemble performer. For the first three years of the programme your programme will also include a contextual study of jazz music. The fourth, graduate year of study is exclusively focused on performance and includes an extended recital. The University of Chichester’s music department is one of the largest in the country and the location offers easy access to the growing South coast music scene. Jazz Studies within the Music Subject Area at the University of Chichester aims to provide students with high quality tuition combined with an exciting and enjoyable educational journey that challenges the individual through practical and theoretical skills. All students within the department have opportunities to become part of the jazz community, whether they are jazz musicians or not, and the curriculum encourages students to develop an appreciation of jazz as music of diversity, inclusivity and creativity. These values underpin the ethos of the teaching and are embedded within the curriculum so our students, who will inherit this growing tradition, foster a lifelong learning attitude to any creative endeavour and can appreciate jazz as a collaborative community art form.